Day two of our car adventure and seeing another sunny day on the forecast we decided to head to the coast. Our one requirement was to make sure we went somewhere that we couldn't easily get to by public transport so we decided on the picturesque coastal town of Whitby in North Yorkshire. Whitby is an hour and a half away in the car yet to get a train from Newcastle takes over 3 hours. We arrived just after 11:00 am and the town was already pretty busy with people out to enjoy the sunshine. As it wasn't too far off lunchtime (we are always thinking about our stomachs) we decided to earn our food by starting our day with the 199 step climb up to the Abbey. The view was absolutely stunning but the air was thick with very annoying flies (unfortunately the flies seemed to have moved into Whitby for the day and they were irritating us on and off throughout our trip) so I don't have many photos to share with you from the top. After our climb we decided we would let ourselves have a nice lunch and being by the sea there was only one choice for us, Fish and Chips. We wanted to make sure our day didn't get too costly so we had a little walk around to try and find somewhere that looked nice but also offered good value. After a short while we found Hadley's Fish Restaurant, a family run business that offers a really lovely restaurant in an ideal location and with great prices. When we first saw the restaurant we actually thought it looked too nice to fall within our budget so we were really happy to find that wasn't the case. We both had "a Traditional Yorkshire Tea" which consisted of cod and chips with bread and butter and a pot of tea for £7.45 each. 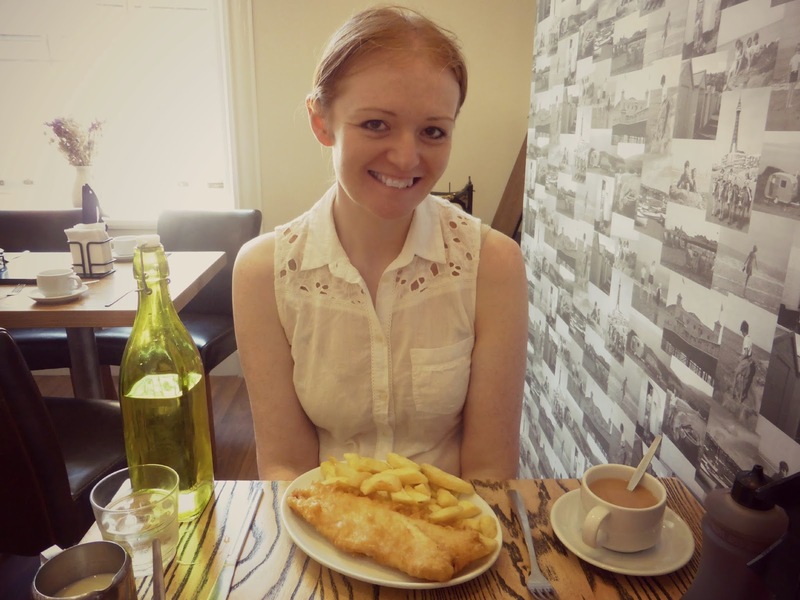 It was a perfect sized portion and we both agreed that it was the best fish and chips we'd tried in a while and much tastier than a lot of overly hyped fish and chip restaurants we've been to over the last year. The restaurant is really big with plenty of seats so although Whitby was busy we got a table straight away. Once we'd been fed we went for a little explore round the Town. 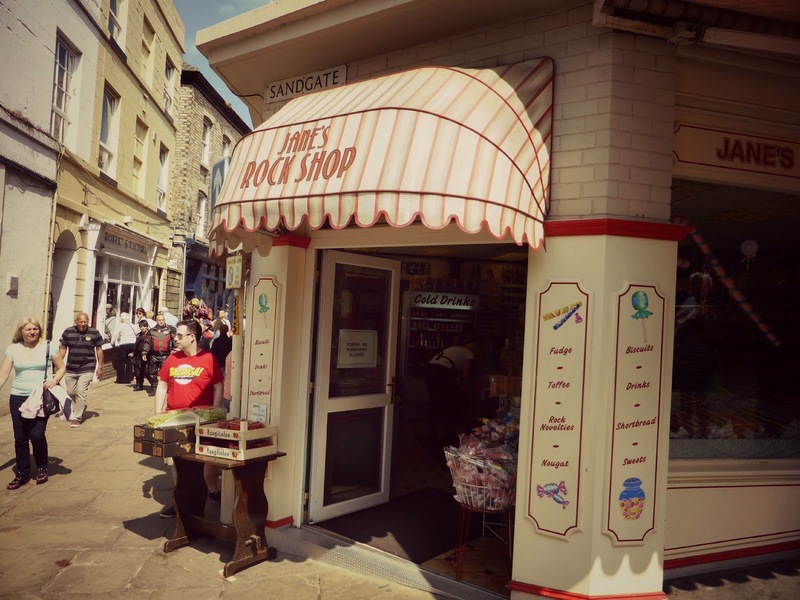 Whitby has lots of cobbled streets filled with sweet shops, shabby chic gift shops, tea rooms and ice-cream parlours. There was so much to look at and I had to stop myself walking into each cake shop to order cake. Next time! We had a stroll along the Pier and spent a little while sat on a bench admiring the beautiful view of the Abbey and letting the sun hit our pale pasty legs. It was bliss and there were moments we completely lost ourselves and it began to feel a little like we were on holiday. Moving away from the crowds we climbed upwards for a walk along the Promenade where we stumbled across a little crazy golf course. It was only £2.20 each so we decided to stop for a quick game. Simon won although I can pretend that he didn't because I tend to act like a child during crazy golf and stop scoring as soon as I realise I'm falling behind. There was just time for a quick sit down with an ice-cream before heading back to the car. I'm kicking myself now for not trying a lemon top, an ice-cream with a dollop of lemon sorbet on top, which is a famous food in the area. Unfortunately the "99" was too tempting to ignore. We had a fantastic time and the drive through the North Yorkshire Moors on the way home was perfect. We felt very reluctant to return the car to the car rental office on Monday and really miss it already. I can't wait till we can get one of our own and go on more adventures. Lovely pictures and such a great day for you! I love Whitby. I know I already live in a seaside town, but Whitby is different to mine. It's such a lovely small town, but has so much going on. I was quite sad that we'd missed Goth weekend there, a few weeks ago.. I'd always wanted to go to marvel at the sights. I know I;m echoing everyone who has commented so far, but I love Whitby! Last time I was there it was the middle of winter, freezing but so quiet and peaceful! Oh I went to Whitby many a time growing up - although its always so so busy with tourist that we often started to head to Filey instead - which if you love long beaches, arcades and rock pools is well worth a visit. Nothing beats a game of crazy golf by the sea either! I absolutely love Whitby! I'm dying to for Goth weekend sometime!